Home > Featured > A Krazy New Year! It was our first new year’s eve as a couple. I’m not too sure if it’s a cultural thing, but our relatives (both from wifey’s Filipino side and my Tsinoy side), encouraged us to just stay home at the turn of the clock come January 1, 2014 becasue it’s our first. Although we are not a superstitious couple, we obliged to their prodding. We would love to have our first new year in our new home, together in each other’s company. I would honestly say that our first year as husband and wife, since we got married last February 10, 213, was not a smooth one. We had our own share of monstrous arguments along the way; but it was generally a loving year filled with travel stints we would be sharing soon. Earlier on New Year’s eve, our itchy feet led us to our last eat out destination of choice – Krazy Garlik in Greenbelt 5. It was not our first time in Krazy Garlik, but it was our first in this branch. 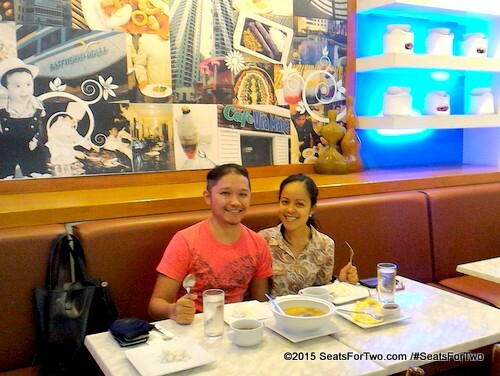 Aside from being our last eat out together for 2013, we were also excited on how this branch compares to the others. 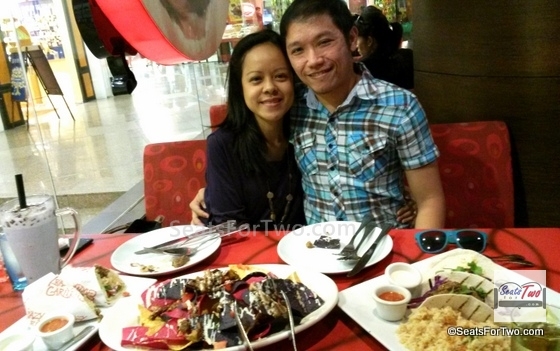 We just visited Krazy Garlik Promenade in Greenhills a few weeks ago. The nachos came first. 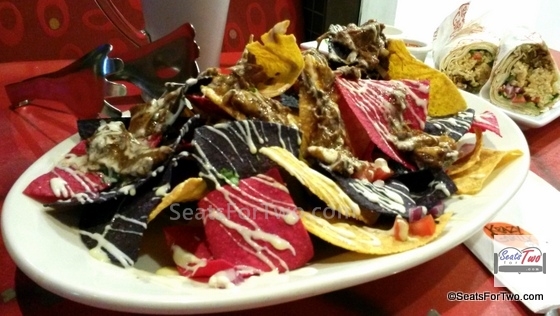 It was huge heap of crunchy Krazy Garlic Nachos (Php595) with a generous serving of beef asado chunks, cheese sauce, and sprinkles of chopped red onion,s fresh tomatoes, and jalapenos. I would say it’s well good for 4 people. So wifey and I had to exert an extra finishing all of it. 🙂 Foodie tip: you can order a second serving of cheese and sweet and sour cream as dips for free. 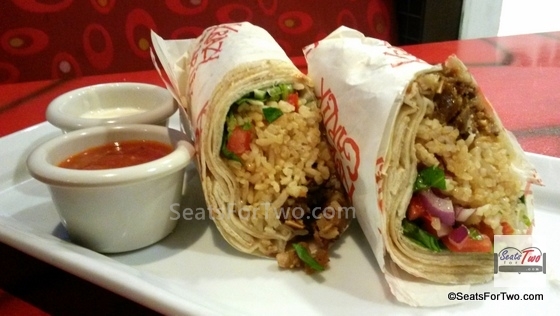 Next, we ordered a huge Amazing Sisig Burrito (Php 275) served sliced-in-two (I’d call it Burrito For Two). 🙂 It’s a combination of, well, pork sisig, fresh lettuce, tomatoes & salsa, and garlic rice wrapped in a soft flour tortilla. The tortilla was actually already sufficient to balance with the sisig and the other ingredients so I hoped they could minimize the rice and put in more of the actual sisig meat. That aside, the taste was excellent for a burrito. 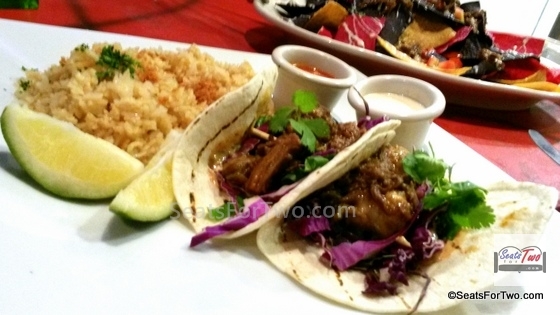 Lastly, we had the Krazy Braised Beef totilla crusted taco (Php 305). This one had brasied beef chucks all over. 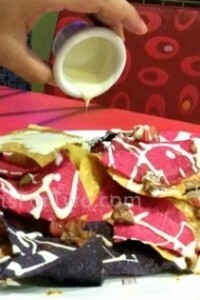 It is also served with garlic rice, aioli & salsa, drizzled with chipotle sauce. 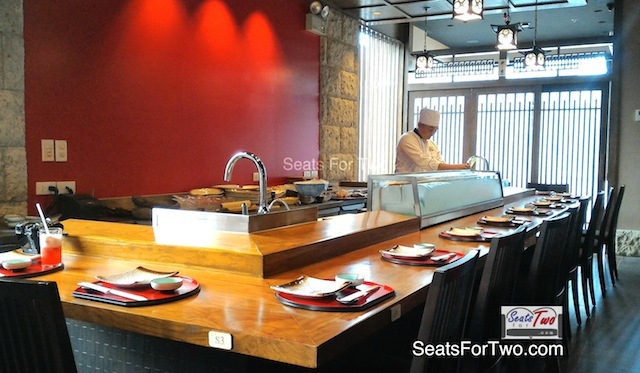 This is Seats For Two‘s choice of recommendation for taste and value. We were so full afterwards. This is one of those rare times that we didn’t have a dessert after meal. I hope Krazy Garlik will bring the Krazy Bunch back soon. After lunch, we had a short stroll around the mall and headed home. Marjorie said she still needs to prepare some things for our new yea’s eve dinner. 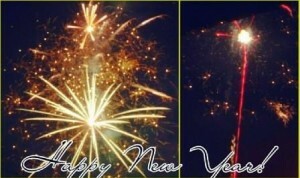 As expected, firecrackers in our community was minimal until 11pm struck. A few minutes before 12 midnight, all our houselights were opened and we were watching the sky lightt up with fireworks as we lightly hug each other. It was a great feeling to welcome the new in the company of your dearly loved one, and hugging them tight as you count down 10 to 1. Unrehearsed, we jumped up and down like silly kids by the window and in front of the television as the Philippines welcomed 2014 in broadcast. Then we hugged each other again, exchanged greetings and kisses, and went down stairs for Media Noche (new year’s eve dinner). 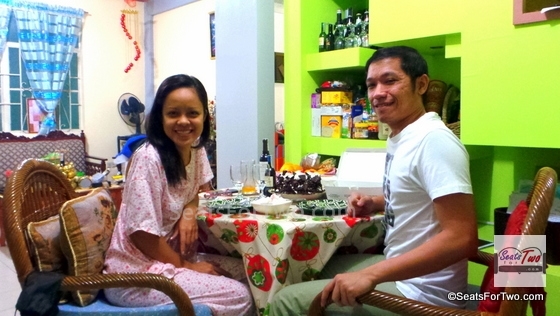 We had a simple meal, a simple setup in pajamas, a simple new year. But it was my most special one to date .